This section suggests things you can do at work or in your home office to encourage green business and to create a healthier, more eco-friendly work environment. If your boss and your company haven’t already started to take measures to become more eco friendly, now is the time! There are many ways to green up your workplace that are easily implemented without a lot of added expense. 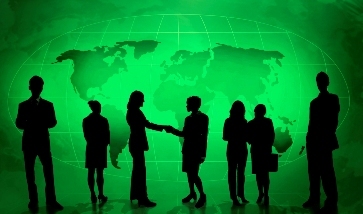 Help your company to become more environmentally responsible and contribute to putting an end to global warming. 1. Use recycled paper or alternatives made from hemp, bamboo, or cotton for printing reports, memos, letters, etc. 2. Keep a recycling bin in the staff break room for pop cans and water bottles. Better yet, provide filtered drinking water to cut down on bottled water waste. 3. Use soy based inks in printers, copy machines, and fax machines. 4. Get off the junk mail lists. This is a great way to go green at work and save trees, too. Go to www.41pounds.org and also visit www.newdream.org for help and information in doing this. 5. Sign up for e-bills with your utility and credit card companies and anyone else you do business with. Pay your bills online and save paper and money for stamps. 6. Recycle or donate old office equipment. 7. 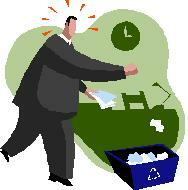 Recycle toner and ink cartridges and buy remanufactured ones. 8. Go paperless whenever possible. Store and share documents with colleagues and coworkers online instead of in hard copy. 9. Remember to turn off the computer and power strip at the end of the day. 10. Bring in your own mug and dishware for lunch breaks. Provide reusable mugs, silverware, and dishes for everyone to use at work. 11. Foster sustainable and green business practices by utilizing fair trade and organic coffee and tea. Buy local, organic food as much as possible for office events and parties. 12. For office maintenance, use nontoxic, organic, and eco friendly cleaning products. 13. Green business doesn't have to be boring! Improve indoor air quality and beautify your work area at the same time with plants and flowers.